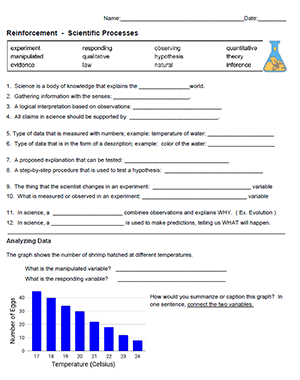 In addition, a section is included that has a graph and students must analyze the graph and identify the manipulated variable and the responding variable (independent vs dependent) . Students often have trouble with this concepts. Even after going over them and doing labs such as “How Does a Water Strider Stay Afloat?” students still have difficult identifying variables and a control group in an experiment. One way that I use these reinforcement worksheets is to give students 5-10 minutes of quiet independent work time, then go over the answers with them. I will project the worksheet on the whiteboard and have a student volunteer write in the answers. The next day, you can give students the worksheet with the word bank removed for a more challenging exercise. If you download the google doc linked below, you can save a copy to your own drive and modify it.